Information: A privately published, limited edition handout for attendees of GatchaCon '97. This show was held as part of the SanDiego Comic Convention. 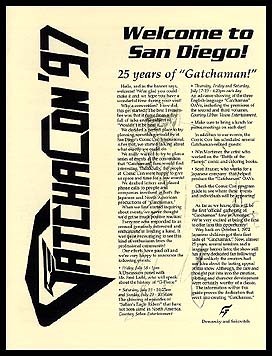 This fanzine included translations of the original character concepts for Gatchaman, The Gatchaman planning notes, the Gatchaman II planning notes, the Gatchman Fighter planning notes, Gatchaman character notes from the OAVs, the mecha specifications from all versions of Gatchaman and a section on the additional versions of Gatchaman around the world.